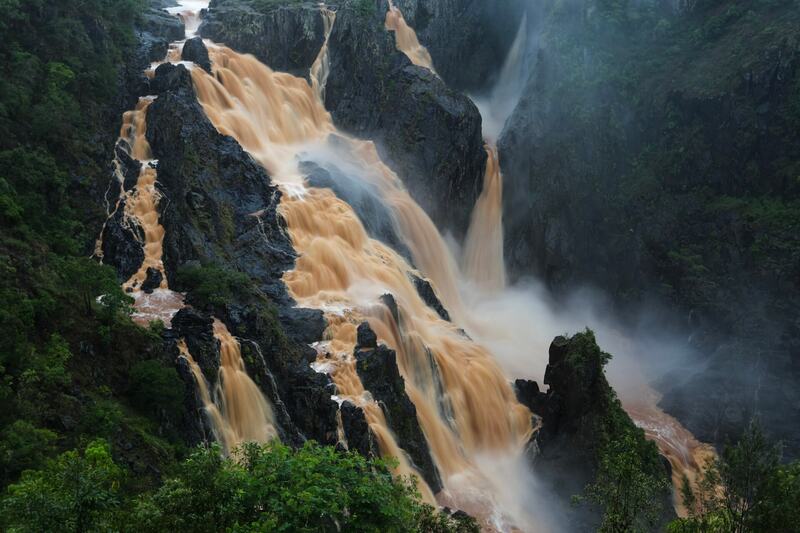 The Barron Falls (Aboriginal: Din Din) is a steep tiered cascade waterfall on the Barron River located where the river descends from the Atherton Tablelands to the Cairns coastal plain, in Queensland, Australia. 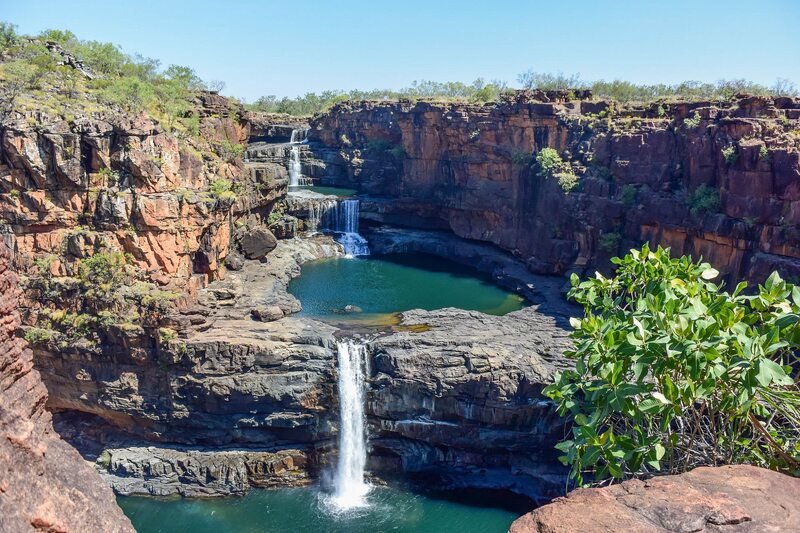 Protected within the Barron Gorge National Park, the volume of water seen in the upper photo only occurs after substantial rainfall during the wet season. For much of the rest of the year, little more than a trickle is evident, due in part to the presence of a weir behind the head of the falls that supplies the Barron Gorge Hydroelectric Power Station located downstream in the gorge. The Barron Falls may be viewed and accessed by road via the Kennedy Highway that crosses the Barron River upstream of the falls, near Kuranda. The narrow-gauge Kuranda Scenic Railway and the Skyrail aerial tram also leads from the coastal plain to the tablelands. The train stops at Barron Falls overlook, where passengers may disembark for several minutes. The Skyrail stops at two rainforest mid-stations, Red Peak and Barron Falls. The trail at Barron Falls Skyrail station leads through the rainforest to three separate lookouts providing views of the Gorge and Falls. The Blue Mountains is a mountainous region and a mountain range located in New South Wales, Australia. The region borders on Sydney's metropolitan area, its foothills starting about 50 kilometres (31 mi) west of the state capital. The public's understanding of the extent of the Blue Mountains is varied, as it forms only part of an extensive mountainous area associated with the Great Dividing Range. Officially the Blue Mountains region is bounded by the Nepean and Hawkesbury rivers in the east, the Coxs River and Lake Burragorang to the west and south, and the Wolgan and Colo rivers to the north. 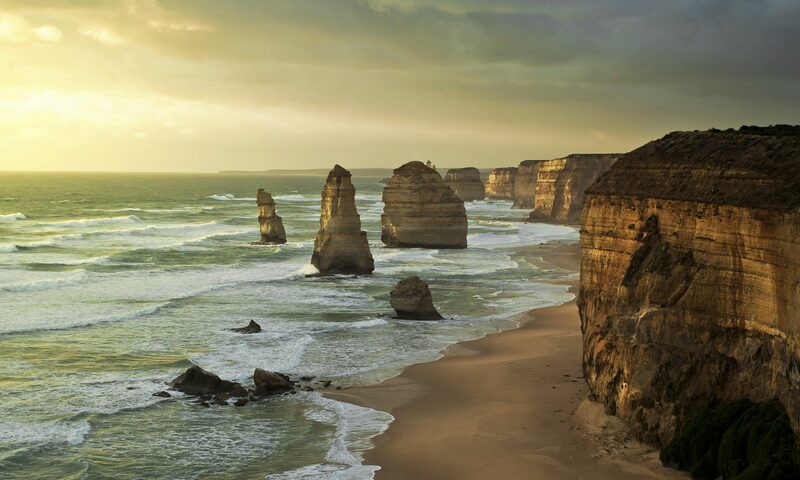 Geologically, it is situated in the central parts of the Sydney Basin. 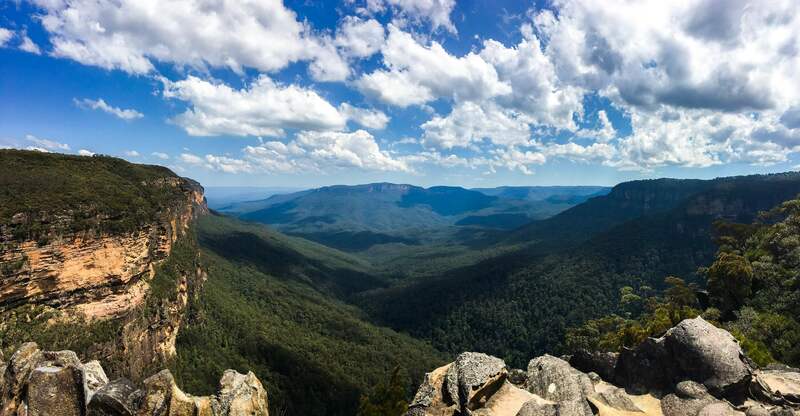 The Blue Mountains Range comprises a range of mountains, plateaux and escarpments extending off the Great Dividing Range about 4.8 kilometres (3.0 mi) northwest of Wolgan Gap in a generally southeasternly direction for about 96 kilometres (60 mi), terminating at Emu Plains. For about two thirds of its length it is traversed by the Great Western Highway and the Main Western railway line. Several established towns are situated on its heights, including Katoomba, Blackheath, Mount Victoria, and Springwood. The range forms the watershed between Coxs River to the south and the Grose and Wolgan rivers to the north. The range contains the Explorer Range and the Bell Range. 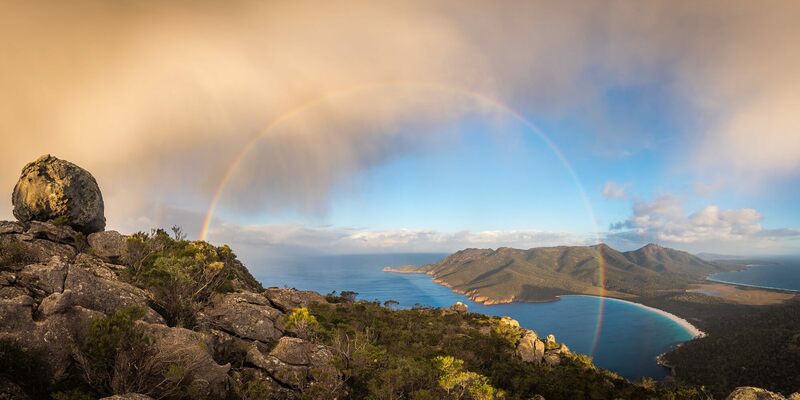 The Freycinet Peninsula is a large peninsula located on the eastern coast of Tasmania, Australia. The peninsula is located north of Schouten Island and is contained within the Freycinet National Park. The peninsula is a large, dramatic land formation carved into Tasmania's eastern coastline. Known for its pink granite mountain range, The Hazards, and its sheltered, white sand beaches, the peninsula is the location for Freycinet National Park, the first national park to be declared in Tasmania, along with Mt Field National Park. Also on the peninsula is the village of Coles Bay, the Friendly Beaches Reserve, and Wineglass and Honeymoon bays. The "Vanderlyn Island" was the last sighting of Australia by Abel Tasman in 1642 before turning east to New Zealand. Myall Lakes National Park is a national park in New South Wales, Australia, 188 kilometres (117 mi) northeast of Sydney. 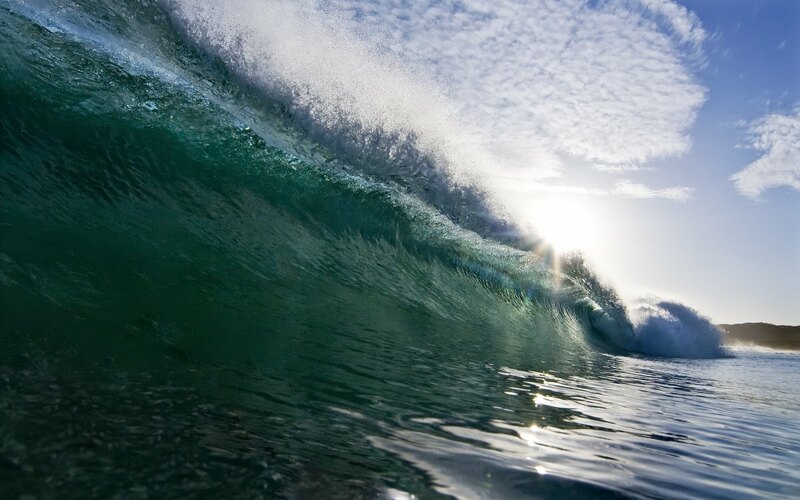 It surrounds the scenic Myall Lakes, and includes Broughton Island.